George Keremedjiev is president of Tecknow Education Services, Inc., Bozeman, MT: 406/587-4751; www.mfgadvice.com. Keremedjiev, who writes the monthly Metalforming Electronics column for MetalForming, thanks Schuler, AP&T and Graebener for their cooperation in the preparation of this article. In 1776, Thomas Paine described the fledgling American experiment in independence as, “These are the times that try men’s souls.” Today’s economic uncertainties likewise tug mightily at the corporate ranks, as metalformers of all sizes seek a more secure path through the economic thicket. Our industry needs a technological jolt to innovate its to prosperity; this is especially true for Tier Two and Three suppliers of metalformed parts. This article attempts to propose just such an economic opportunity: hot stamping, a technology that currently resides primarily with OEM and Tier One suppliers. Also referred to as hot forming, hot press forming, press hardening and pressure-controlled hardening, the fundamentals of the technology are well established and have been proven economically viable worldwide. Throughout the past several years there have been numerous articles published on hot stamping. This presentation differs from the rest, as it’s focused primarily on hot stamping as an opportunity for lower-tier metalformers. The word on the street is that there is an immediate need for hundreds of hot-stamped automotive parts just in the United States alone, not to mention the rest of North America. In other words, I view hot stamping as a leapfrogging mechanism that can open doors within existing customer ranks as well as within a multitude of new ones. 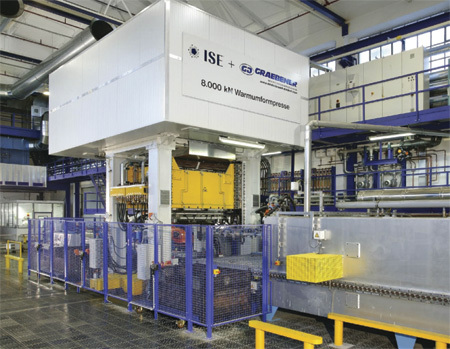 Evident in this photo of a Graebner hot-stamping line is the plumbing system on the back wall, for the line’s chiller. Although considered by many to be new and mysterious in North America, hot stamping was invented in Sweden in 1973 by Carl-Erik Ridderstrale, of Plannja Hard Tech, for the manufacture of farm implements. The motivator was the need for lightweight yet strong steel components—similar to the requirements dictated by the automobile industry’s increasing safety and crash-survival standards, along with the need to minimize vehicle carbon footprint. Now we’re seeing hot-stamped parts displace cold-stamped high-strength steels in some critical areas of automobiles, such as safety pillars. There is no comprehensive book on modern hot stamping, and while academics gather yearly at an event in Europe to discuss the process, along with participation from the private stamping sector, there is no equivalent in North America. And it’s nearly impossible for Tier Two or Three stampers to view a hot-stamping line in North America, as the manufacturers running such lines cautiously guard their processes from visitors’ eyes. 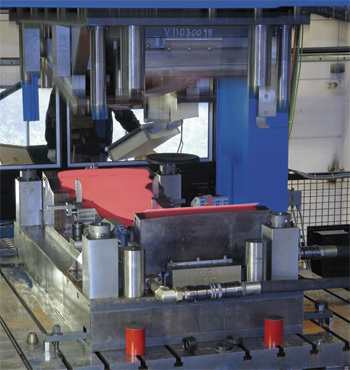 The hot-stamping process, stripped to its bare essentials, begins with manganese-boron steel blanks—flat or preformed, depending on the process variation—fed either by robot or pick-and-place mechanism into an oven, where they are carefully heated. The heating process can cause scaling on the surface of the blanks, resulting in excessive die wear downstream—stampers can minimize the amount of scaling by specifying that the steel be supplied with a special coating. Most ovens move the blanks in a linear manner over rollers that expose the blanks to intense heat over a period of several minutes. As stampers evaluate technology options, they should take care to inquire about other heating options, as there are several new oven designs entering the market. As displayed in the accompanying (and simplified) continuous-cooling transformation (CCT) diagram, the blue line represents the heating and cooling process, with its tight timing window within which the hot-stamping process must occur. The trajectory of the blue line begins with the manganese-boron steel blank heated in an oven to about 950 deg. C, to allow the blank to reach the austenite phase. 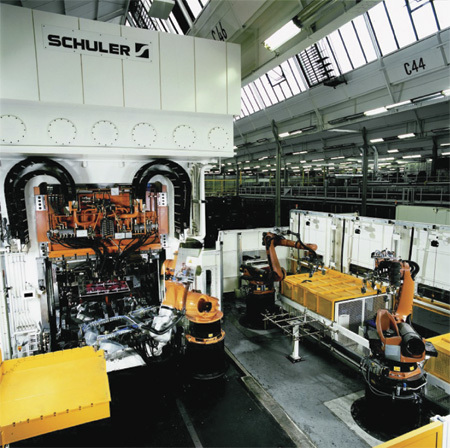 These photos from Schuler showcase a robot-tended hot-stamping line and the feeding of heated blanks into the die. After exiting the oven, each heated blank transfers to a hydraulic press via robot or pick-and-place mechanism. At this stage the blank has a strange muted glow to it as it settles into the lower die section. 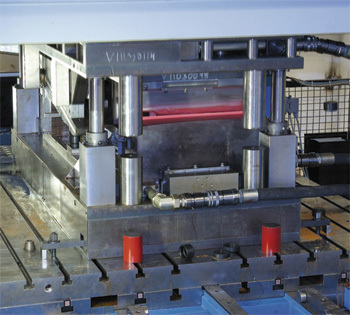 The press closes tightly to clamp the die shut at a relatively high tonnage—not so much for the forming process but for the need to create an extremely tight bond between the die surfaces and the part. The die is permeated with channels in its upper and lower sections, designed to distribute cooling water throughout. The tightly closed die functions as a heat sink, absorbing the heat from the part. 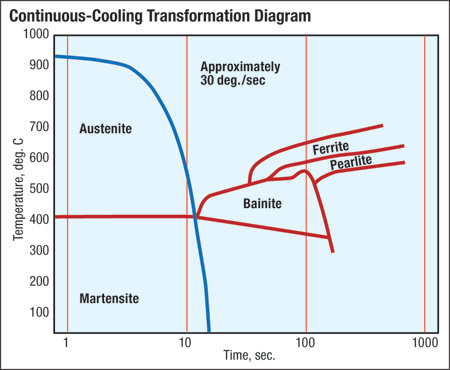 The blank cools quickly, within seconds, by several hundred degrees until it reaches the martensite phase. This results in a lightweight blank with phenomenal strength characteristics. Dies open and closed, stationed in an AP&T hot-stamping line. The closed die performs forming and cooling functions. Cool the blank too slowly and it will enter the bainite, ferrite or pearlite phases and exhibit out-of-spec properties. Conversely, by controlling the cooling process in the die, it is possible to create hot-stamped parts exhibiting various strength characteristics throughout their length. This proves critical in applications requiring a part to crumple in one area while maintaining stiffness in another, such as an automotive safety pillar. 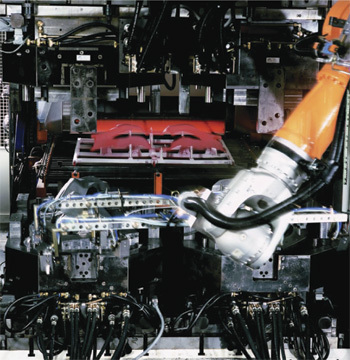 After a few seconds, the die opens and the automation device removes the part from the die and places it on a rack. Blank trimming typically is performed by laser cutting; alternative trimming techniques also are used. The most engineering- and design-intense part of the entire process is the die. The die designer must be thoroughly familiar not only with conventional design and simulation software, but he also must be fluent with thermal-simulation software. Such software might include metallurgical-simulation software for the understanding of the metallurgical transformations of a particular part within the die. Other critical success factors include design of the cooling channels and the chiller, and the use of sensors to monitor performance. Now let’s explore the potential economic opportunities hot stamping offers Tier Two and Three stampers. I am convinced that it is simply a matter of time before sectors other than automotive will adopt hot stamping to remove weight from, while strengthening, their products. Who would not want a lighter and stronger lawn mower? What about replacing machined or cast parts with hot-stamped parts? And how about the aerospace industry, where strength and weight als are a concern? Perhaps parts currently stamped from exotic materials such as titanium or magnesium alloys could be candidates for hot-stamped steel parts instead. But how to pay for that first hot-stamping line? There are various grants available to help offset the costs of research and development in manufacturing. Your state likely offers such a program, a perfect opportunity to obtain at least partial funding for an experimental hot-stamping line that would allow a stamper to approach RFQs from current and potential clients for hot-stamped parts. Similar programs abound within the federal government. Such an experimental setup would allow a stamper to revisit current cold-stamped parts and perhaps develop viable and lucrative alternatives. I quite liked this. How do I find a book that talk about the subject? Hello, Looking to get in touch with Hot forming component manufacturers in China. Great article!! Would love to see some government funding step up for Tier 2 suupliers like us to help open up endless possibilities and create even more jobs here local and around the world.